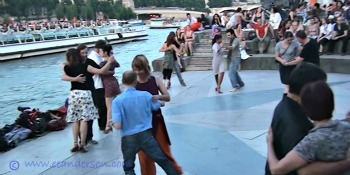 Tango is such a beautiful dance and I always dreamed of dancing by the Seine in Paris when I was a young girl. Dreams can come true! If you are in Paris you really should check this out regardless of whether you dance or not. It is such a pleasant experience. I would suggest making an evening of it like we did. We took the metro line 10 and got off at Gare d’Austerlitz station and walked past the Jardin des Plantes. The dance takes place in these little roman amphitheaters. We were told to go early as there would be wine and dining, so we thought there would be booths to buy food. What they meant was take a picnic as that is what everyone else was doing. We went over to a deli nearby and bought everything we needed and had a lovely picnic on the grassy bank like everyone else and people watched. 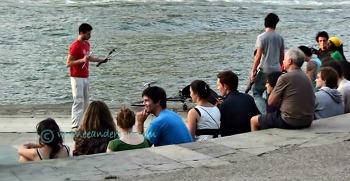 Pigeon having a picnic on the banks of the Seine, Paris and waiting for the tango to start. All kinds of different types of people were arriving both young and old, Parisians and foreigners. 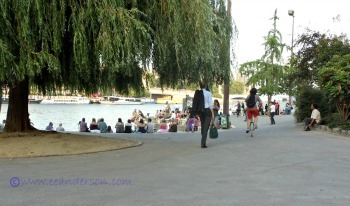 Some were dressed elegantly and some tourists arrived in shorts. They arrived by foot or bicycle. One lady arrived on a Vespa with high heels. Most wore comfortable shoes and changes them on arrival like the woman in maryjanes that changed into beautiful purple and silver tango shoes. I was envious as I had to wear fancy sandals as my feet were so swollen that I couldn’t get my shoes on. I felt a little better when I saw one fellow dancing in his bare feet. It reminded me of the dances we went to when we were very young. People arrived as singles or couples and asked each other to dance. We noticed that they gave their partners tips and instructions and they passed those techniques on to others. It was clear that a lot of them were experienced dancers. Al and I are not very experienced and I am a bit physically challenged but I love to dance. Years ago we went out dancing several nights a week. We got pretty good at a variety of popular dances but mostly just had a lot of fun and it is definitely great exercise. Then of course it became impossible for me for awhile. When my health started to improve we took some tango lessons and I started dancing again. That night My legs were still swollen from the flight but better than the week before when they were like tree stumps. 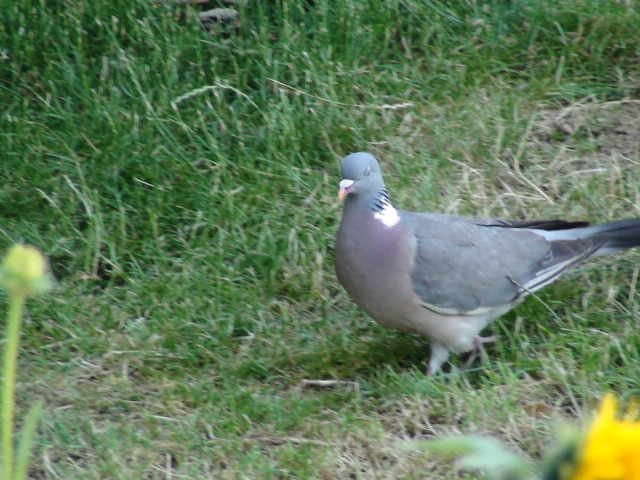 One leg went down faster than the other so I was a bit lopsided looking. 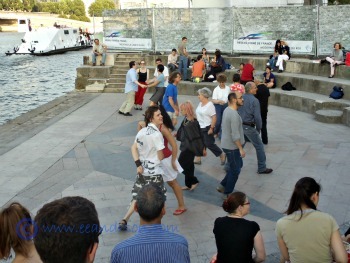 It didn’t matter I am sure no one noticed and I was dancing at the Seine in Paris. We walked along the river side for awhile and stopped for a desert crepe on the way home at our favorite creperie. It was a little late and they were closing up but the waiter remembered us from another time and gave us a seat. We had gorgeous weather and a great ending for a wonderful evening. If you don’t tango walk along and check out some of the other amphitheaters. It is very entertaining. There was a group doing Celtic square dancing and another with a show of juggling, interpretive dance and drumming bongos and fire eaters. It took place near the spot were most of the tour boats turned around to go back to the Eiffel tower, so it was also fun to watch all the different ships. The dances take place every night after 7:00 PM on the left bank of the Seine at Quay St Bernard, between Sully and Austerlatz bridges. Sometimes there is an instructor and I found that it really didn’t get going until after the sun was setting. This entry was posted in France, Paris, Travel, Travel tips and tagged Dance, France, Paris, phyically challenged, Seine, Tango, travel, travel tips. Bookmark the permalink. It is a great thing that Tango is danced outside the Argentina. There are states in which tango is danced. One is Finland in which we have Tango Festivals. Thank you, and I agree that, it is a great thing. It’s nice to hear that you have Tango festivals in Finland, I bet it’s a lot of fun. We also tango in Mexico and Canada. How nice to read that You do Tangos in Mexico and Canada. Our Tangos differs from Argentinean style and that means we have our own Tangos. Ours are not so passionate, but they are sentimental or in some cases melancholy. I do not know if You have heard the name Malando (Dutch). His orchestra played the best Tangos by our compositor Toivo Kärki. The name of record is “Malando Plays Toivo Kärki”. Also many of our Tango singers have visited in Argentina having been performing Finnish Tangos to Argentine people. I give here, if You do not mind, an example of our Tangos from the Finnish movie called “the match factorygirl”. 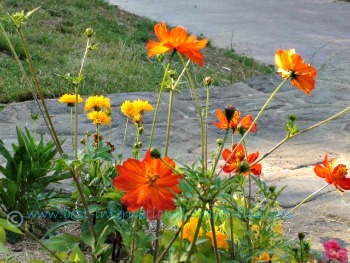 It is called Satumaa (Fairyland). Thank you for sharing your tango video. Too bad the young lady did not get to dance. Actually your video is very much like some I have seen coming from Argentina (moving smoothly around the floor). The group I dance with in Mexico is similar. Pingback: AXOLOTL,CUENTO DE JULIO CORTÁZAR | "AÍ POESÍA"